Lily 'Stargazer' is making my patio path rather sensational. My Regale lilies were just as good. If only the garden were like this all the year. My wheelchair can now only just about squeeze through along the path. Because of all the pots the wheels have only an inch or two of clearance, literally. My space is so limited and I really do garden it to the full. Lovely display and the Stargazer lily is gorgeous. Brilliant display Jonathan. Are you being judged on Thursday? Hi Andrew, As far as I know, I've not been short-listed by the judges. I've not been informed as such. Because my garden is at the rear of a block of private flats in communal grounds, it is rarely seen by members of the public. I think the Bracknell In Bloom judges probably consider it a very nice little garden, but perhaps not all that relevant to the competition as it does not contribute much (in the visual sense) to the community. Therefore I didn't think it likely that I would 'win' anything. But it isn't winning that counts, but taking part. It's just nice to be part of something. I'm in complete agreement with the others above, Jonathan, your garden is fabulous & about as full as my balcony! Lol! The Lilies are really great. I used to grow them on my balconies when I lived in Spain, but I haven't grown any since I came back to the UK. I also live in a block of flats but my situation is just the opposite of yours! My balcony measures just 3.5m long by 1.5m wide & about 2.10m high. It faces onto the street & I get plenty of admirers! I've never entered it into the Town in Bloom competition for two reasons, 1) I'm not interested in competitions & I grow plants purely for my own pleasure & if that gives other people pleasure, well, that pleases me too! , 2) The competition is also judged in June & my balcony is never fit to be seen at that time. It's is never worth seeing till the middle of July at the earliest, depending on the year. It's also just like an old fashioned cottage garden as everything grows higgledy piggledy with no order. It looks lovely. How long did it take you to get to this stage? Hi Everybody, Glad you all liked the picture. There'll be more photos to come soon. The work is never ending Jeanh. Your balcony is amazing, Balcony. Would be good to see some photos of it 'from standing back'. I'd love to see. I posted a photo of my balcony seen from the street about a week ago! You should find it in my photos. I take a photo from the street about once a month but now with a better mobile with its superior camera I can get lots more shots of the plants on my balcony. The results are better than with my digital camera! Only just "found you" and what a lovely surprise. It is sheer perfection, beautiful. What lot of watering for you. I'm looking forward to more, especially next Spring. Hi Mad, I'm glad you like my garden. I love Carol Kilien too. She comes across so well and communicates so much. I've been having a look at your garden too. It's lovely. Great use of space Jonathan. Everything looks so healthy. I'm glad you enjoyed your visit Muddywalters. 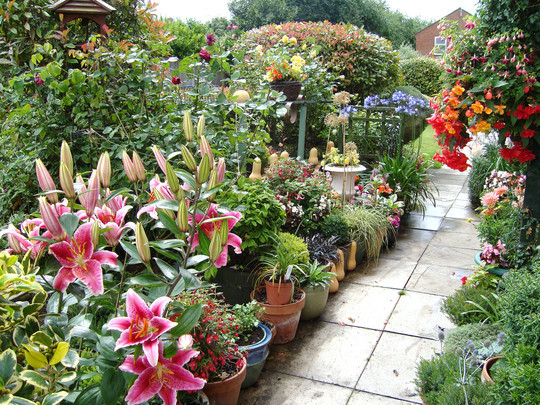 This is absoloutely so beautiful Johnathan - Am new to gardening so just starting off my garden this spring. Love lillies, what sort of conditions do they like? I only have space for pots in the shade any ideas of something that flowers/scented? Hi Annelise, I'm glad you like my pictures. It is very hard to get lilies to grow in shady places as they are sun lovers. I don't know what will produce scent in shade either. Perhaps a Google search for 'shade, scented plants'? I have a tiny shade garden myself, and I grow holly, hellebore, heucheras, tiarella and vincas in it, largely in wooden tubs. Thanks for those shady ones Johnathan - mght try and grow a Lily in a sunny spot. When would I plant Lily bulbs if putting in soil or do you grow in a pot first? I myself would buy and plant in the autumn, but you can do it now, as soon as you can. You can plant straight into a pot or straight into the soil as you prefer. Some types of lilies are slightly better than others for pot growing. You need to plant them quite deep and the pot will need to be big enough to accomodate the roots. I have some 'Stargazer' liles in a pot. I grow it in the same pot every year. I just change the compost once per year, replanting them back into it in the autumn. A mixture of John Innes no 2 compost and multipurpose compost is about right, half and half. By the second year the same bulbs will be about double the size, and the blooms thus doubly big. Plant the lily bulbs on their sides rather than pointing upwards, half way down a big enough pot. Planting them on their sides will help to prevent the top of the bulb rotting. Stargazer is my strongest recommendation to someone growing a lily for the first time. Nice and easy. What a marvellous sight - so colourful. I thought I had problems gardening but you are an inspiration to everyone - physically fit as well as those very disabled like you. It must bring a lot of pleasure to the people who live near you - Very well done. A wonderful array of flowers. What a wonderful display and lots of pots love it! You have such a beautiful garden! Lammie - unfortunately Jonathan passed away four or five years ago, so don't expect a reply from him. Personally, I mulch pots with horticultural grit. This seals in the moisture, prevents mosses and liverwort from growing on the surface, and any weeds are easy to pull out while still small.